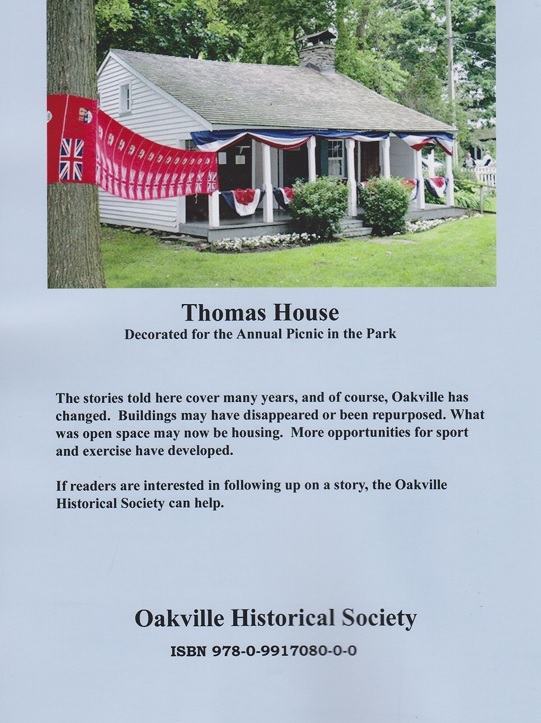 We offer a number of publications that are excellent resources for anyone interested in furthering their knowledge of Oakville's history. They're ideal as gifts for all occasions! Special discounts apply for Society members, so take advantage of your membership (or join!) to save money and support the Society's work at the same time! Available for pick-up at the OHS office (cheque or cash only), or by mail (postage extra). No taxes on any of our publications. 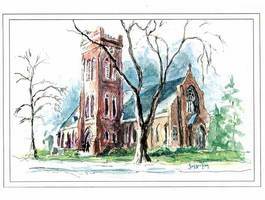 Enjoy this guide of your walk through historic old Oakville. 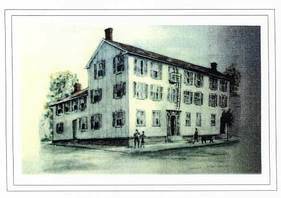 Learn about the people who built these grand old homes and those who lived in them during the 1800s. The new larger-format booklet shows colour pictures of the the beautifully preserved houses as they look today. The stories told here cover many years, from the 1930s to the present. Oakville has changed. Buildings may have disappeared or been repurposed. 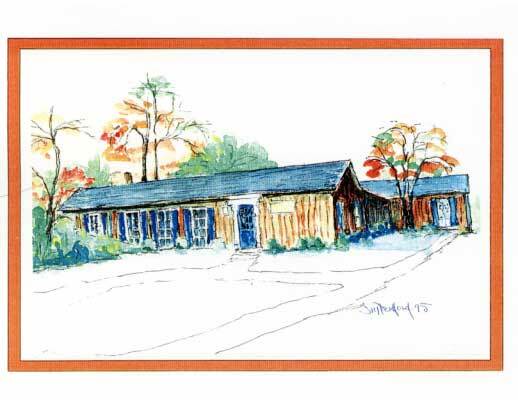 What was open space may now be housing. More opportunities for sport and exercise have developed. We are now working on volume two. Many of you have created memories living in Oakville. Others can recreate or share the memories of their ancestors. We would love you to help us compile our second volume. Write us a letter, call the office, email us, with your stories. If you need help in getting your memories to paper, let us know. We will even come to you and record them by audio and type them for publication. 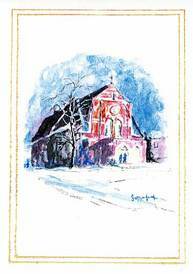 Dedicated to her friend Hazel Mathews, this book is a companion piece, in fact an indispensable adjunct to,Oakville and the Sixteen. Seen through the eyes and recollections of Frances Robin Ahern, this book covers Oakville during the early part of the 20th Century. 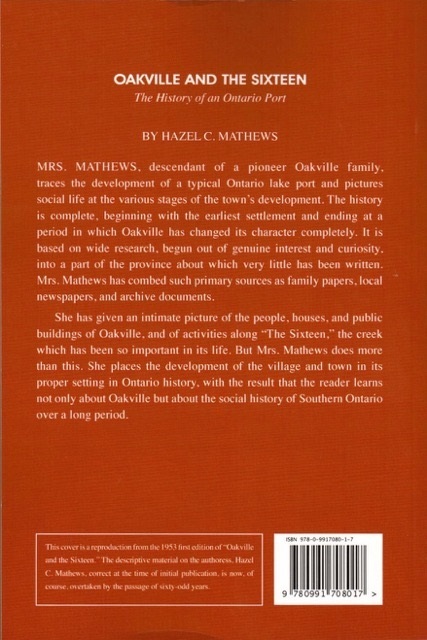 Oakville and the Sixteen by Hazel Chisholm Mathews. 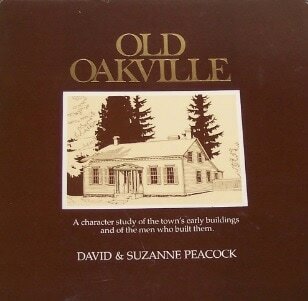 The definitive work on the history of Oakville, from its beginnings to post World War Two. 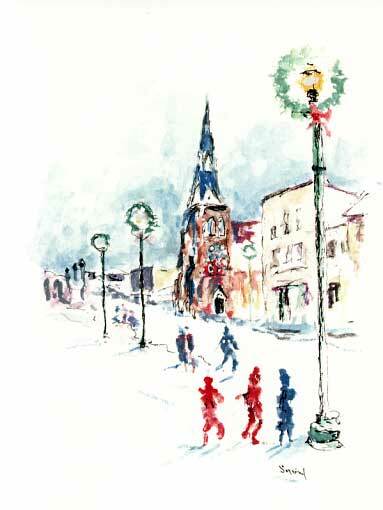 By the founder of the Oakville Historical Society, a beautiful gift and a must have for those who want an in-depth history of Oakville. Back, click on it to enlarge. 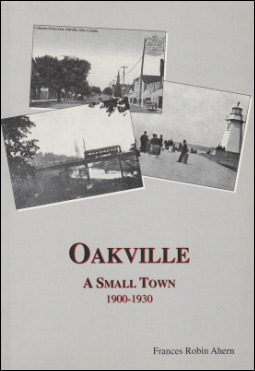 Commemorating Oakville’s 150th Anniversary, this book is a compilation of photos and text that reflects life in and around Oakville. Each story and photograph shows the lives of ordinary people and ensures it is recorded for posterity. See it in our archives. This booklet gives an in-depth history of Bronte Harbour, accompanied with relevant historical photographs. It's currently under revision by the author and a revised edition is expected. 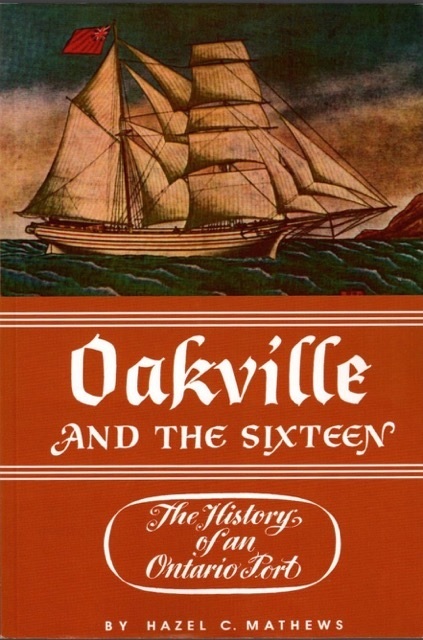 This booklet gives a comprehensive history of Oakville Harbour and is well appointed with several (14) black & white historical photographs.An unbelievable bargain at the price! Tales of ghosts and their activities in Oakville..
More tales of ghosts and their activities in Oakville. 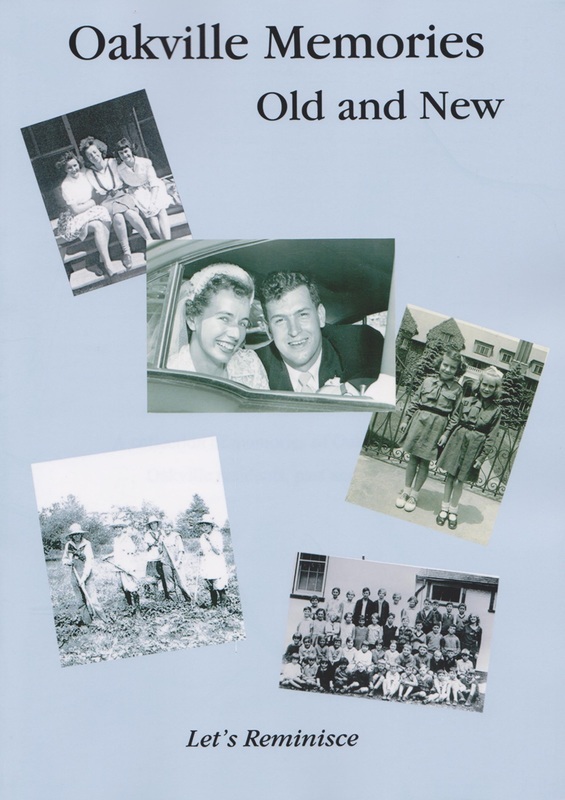 John and George Chisholm of the Parish of Croy, Inverness-shire, and their Descendants by Hazel Chisholm Mathews. 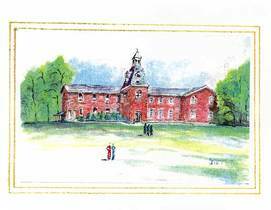 The story of the brothers John and George Chisholm of Croy, Scotland, and some of their descendants in Canada. Includes a genealogy. 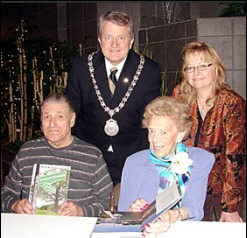 David Ashe and Joyce Burnell, with Mayor Rob Burton and publisher Sheila Creighton. by David Ashe & Joyce Burnell. This collection is based on the life's work of David Ashe, who while employed as a draftsperson with the Town of Oakville compiled a listing of legal survey plans and registry information on the streets of Oakville. 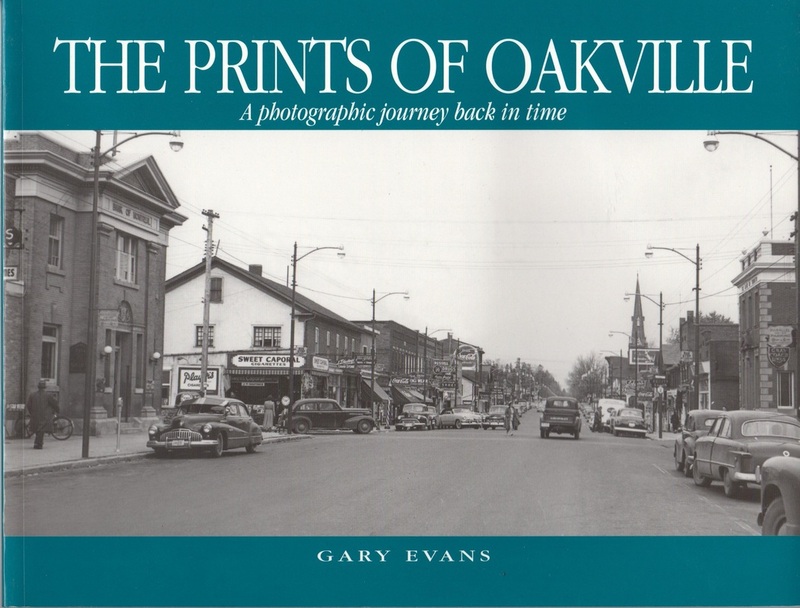 Being a researcher at heart, he went further and spent countless hours of his spare time gathering the history behind Oakville's streets. Joyce Burnell, known for her Ghost books and for spearheading a campaign to save the Woodlands White Oak, has picked a selection of Ashe's street histories and added several Oakville landmarks - some of which are no longer here. Add to this, interesting archival images - some never before seen - combined with newer colour photographs and you have an intriguing reflection of Oakville's unique history. 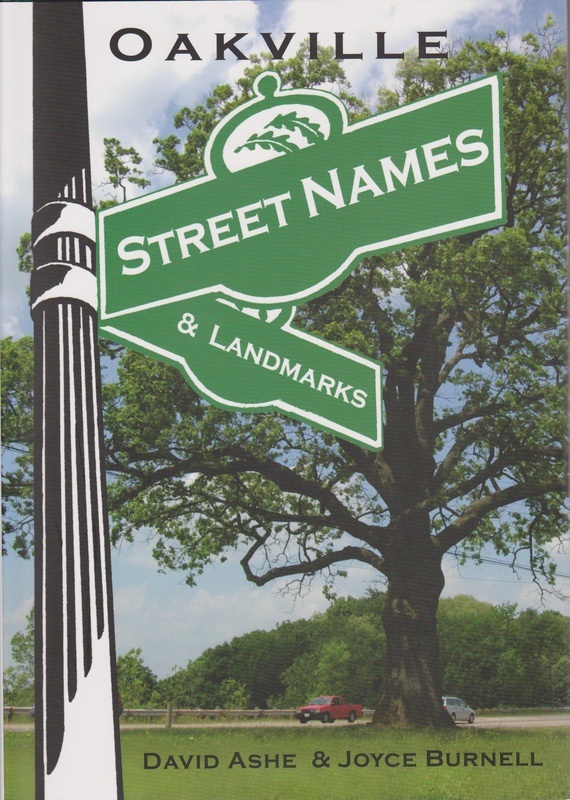 With close to 100 street name histories and over 40 landmarks featured, these interesting vignettes make for an easy, enjoyable read. 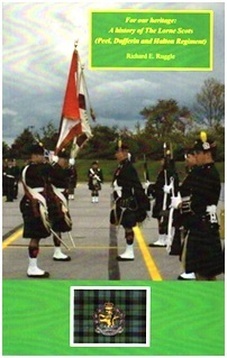 95 pages of great historic pictures and descriptions. The story starts with legislation in 1793. Every man between the ages 16 and 50 was obliged to serve. This was raised to age 60. The book ends with action in Afghanistan and Darfur. 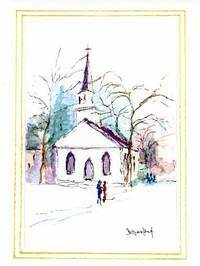 "This is an excellent historical summary written in a highly readable style and well illustrated with relevant pictures throughout the manuscript. ..."
305 pages. Sorry, no longer available for sale. A copy may be seen in the OHS offices. 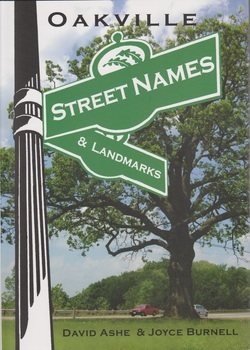 This book illustrates the architectural styles of 45 of the town’s nineteenth-century buildings. 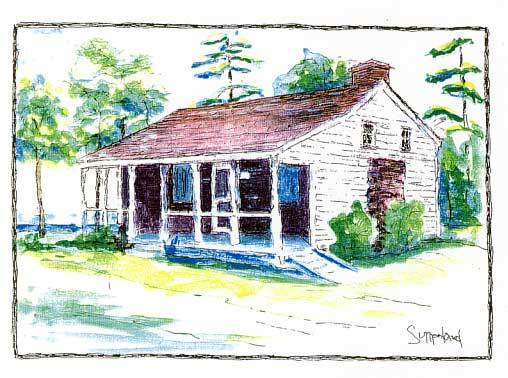 Detailed drawings are complemented with rare old photographs. With insights into the original inhabitants, this book acknowledges the legacy left by our early settlers. This are attractive, fascinating and historically accurate shipwreck charts. One features Lake Ontario. 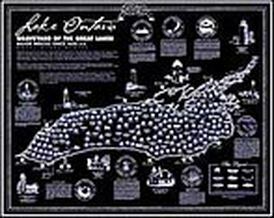 Another features Lake Huron and Georgian Bay. 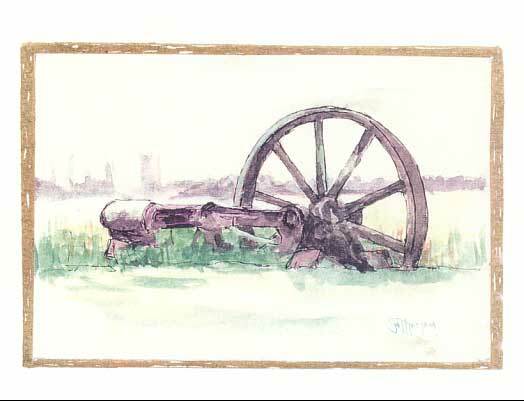 A double ink printing technique is used to create the dark navy blue on cream paper. The result is a stunning, rich effect. For anyone interested in shipwrecks, these maps offer the very best information regarding when, where and what. 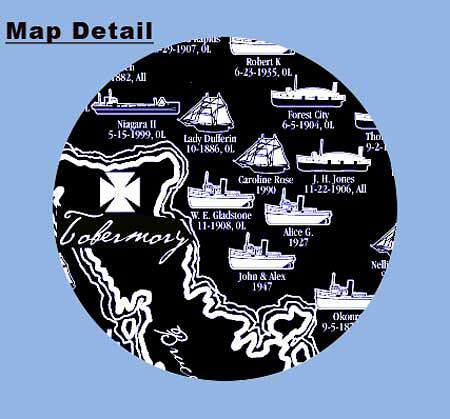 “Portholes of History” give insight, facts and figures. 24" x 30", rolled in a tube. This map is about 8" X 10". It is printed on high quality matte paper, suitable for framing. 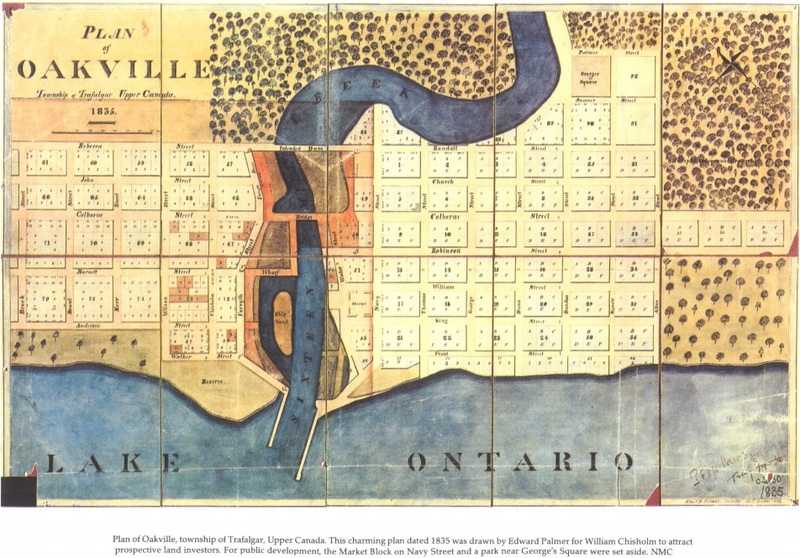 Plan of Oakville, township of Trafalgar, Upper Canada. 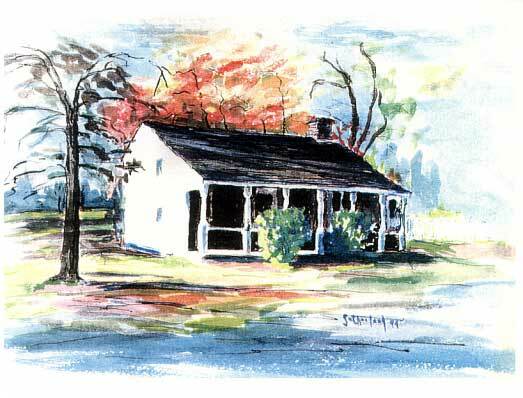 This charming plan dated 1835 was drawn by Edward Palmer for William Chisholm to attract prospective land investors. 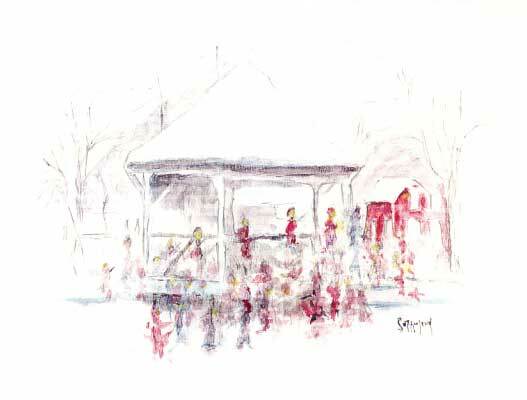 For public development, the Market Block on Navy Street and a park near George's Square were set aside. This map is about 10" X 10". It is printed on high quality matte paper, suitable for framing. 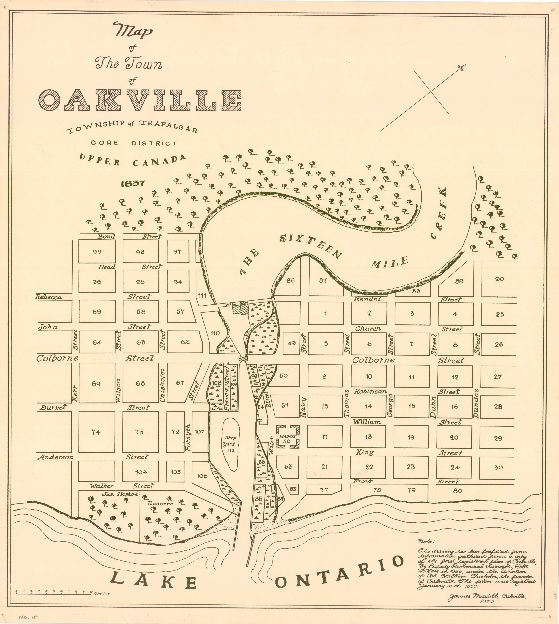 This drawing has been prepared from information gathered from a copy of the first registered plan of Oakville, by Deputy Provincial Surveyor, Robt. H. Kerr in 1836, under the direction of Col. William Chisholm, the founder of Oakville. The plan was registered January 12th. 1850. 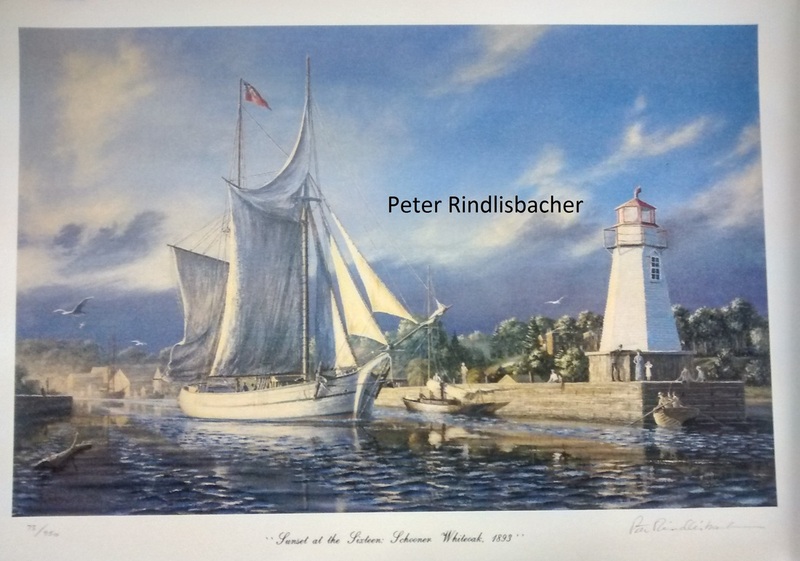 Sunset At The Sixteen : Schooner Whiteoak, 1893 Numbered and signed prints. 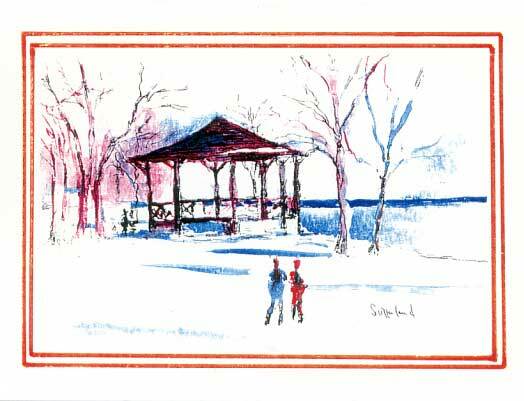 ​Picture 17 3/4" X 114 1/2"
Paper 19 3/4" X 14"
​Read more about the artist. 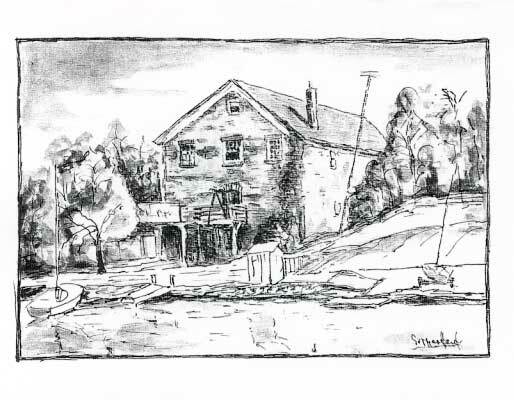 In July 1st 1867 almost 7000 people gathered along the banks of Sixteen Mile Creek to witness the side launch of George Chisholm's new schooner. It was anticipated that the vessel would be called New Dominion to honour Canada's first Dominion Day but George's 10 year old daughter Kate christened her White Oak as a tribute to Oakville's founder William Chisholm. ​This is a limited edition of 950 prints. 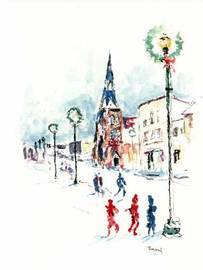 Sketches of Oakville by Don Sutherland. 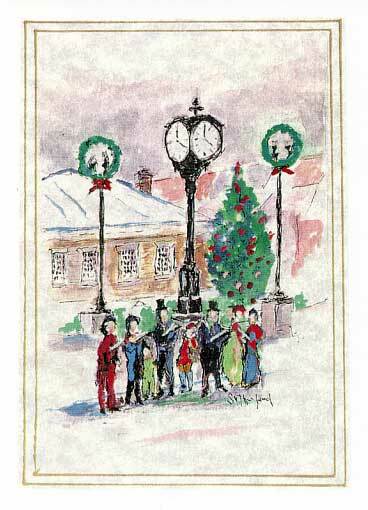 Beautiful sketches of Oakville on 5½" x 4¼" cards (inside blank). All rights bequeathed to the Society by the artist. Members & Non-Members: $1/card. You may order card by number and name.